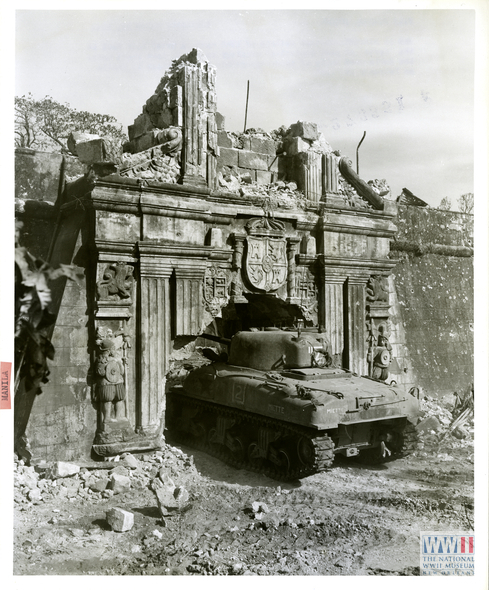 During WWII, Manila fell under the Japanese Imperial Army and was left into ruins after the war. Manila was considered to be the second most destructed city after the war, next to Warsaw. After the war, Manila was reconstructed and later development of land grew outward and people from the provinces and industries began moving near the city. Later on, adjacent towns and cities around Manila grew in population and in 1976 Metro Manila (a.k.a. National Capital Region) was formed. As years pass by, most of the municipilaties within the metro have grown and into cities. Skyscrapers started to rise around the metro in the mid 1990’s specially in Makati which was considered as the financial capital of the country. Metro Manila is currently composed of the cities of Manila, Caloocan, Las Piñas, Makati, Malabon, Mandaluyong, Marikina, Muntinlupa, Navotas, Parañaque, Pasay, Pasig, Quezon, San Juan, Taguig, Valenzuela, and the municipality of Pateros. As of the August2007 National Census, population of Metro Manila was pegged at 11.5 million (approximately 13% of the country’s population). Philippine Airlines to Bali, Bangkok, Beijing, Busan, Fukuoka, Guam, Hangzhou, Ho Chi Minh City, Hong Kong, Honolulu, Jakarta, Las Vegas, Los Angeles, Macau, Melbourne, Nagoya, Osaka-Kansai, Phnom Penh, San Francisco, Seoul-Incheon, Shanghai-Pudong, Singapore, Sydney, Taipei-Taoyuan, Tokyo-Narita, Vancouver, Xiamen, and most domestic locations. Cebu Pacific Air to Bali, Bangkok, Beijing, Brunei, Dubai, Guangzhou, Hanoi, Ho Chi Minh, Hong Kong, Jakarta, Kota Kinabalu, Kuala Lumpur, Macau, Osaka-Kansai, Pusan, Seoul-Incheon, Shanghai, Siem Reap, Singapore, Taipei, Xiamen, and domestic locations. Metro Manila has a good share of locations one may find interest to. It has historical tourist spots left from its colonial past and cultural heritage and museums. As a modern metropolis, Metro Manila offers a number of locations for entertainment, bars, sports, leisure, and shopping. Intramuros. In the beginnings of Spanish colonization, the old settlement of Manila by the mouth of the Pasig River were burned down by the Spaniards. And on it Intramuros was built, which meant “within the walls”. It was the center of political, military, and religious power where influential people in government, friars, meztizos, and the upper class reside while locals and Chinese traders are not allowed to live in. Today, one may hire a calesa ride, a horse drawn carriage, to tour the whole area of Intramuros. Here is a map of Intramuros with a list of other points of interests. Fort Santiago. Located at the northern tip of Intramuros, this defense fortress was built to guard the mouth of the Pasig River. It was told that its current location was the same location of the palace of Rajah Sulayman, the Muslim king of Manila prior to Spanish arrival. In 1896, Jose Rizal, the Philippine national hero, was imprisoned in Fort Santiago before being shot on the beach of Bagumbayan (known as Luneta today). Rizal was charged for treason after writing his seditious novels, the Noli Me Tangere and El Filibusterismo. And during WWII, this served as one of the prisons for POWs where they were tortured by the Japanese Imperial Army. San Agustin Church. Located within Intramuros, it is among the original four baroque churches listed as a UNESCO World Heritage site. The Manila Cathedral, the seat of the Manila Archibishop is also located near it. Both churches survived the major bombardments experienced by Manila during WWII. 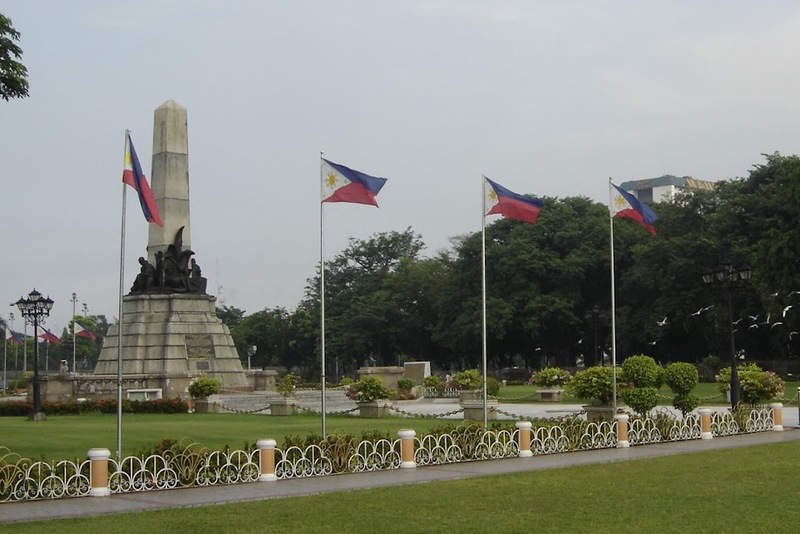 Rizal Park (also known as Luneta Park) is the largest open space in the metro set aside to commemorate the heroism of Dr. Jose P. Rizal. The Rizal Monument marks the spot where the hero was shot by firing squad after fight against the Spanish colonizers through his writings and not by violence. Today the park is the Kilometer Zero, where all road distance measurement all over the country starts. National Museum. Located within the area of Luneta Park, it houses the Philippines priced historic and cultural artifacts that dates back to the colonial periods. The most famous artifact it takes care of is the painting of Juan Luna, the Spolarium which represented the Filipinos slavery during the Spanish period. Manila Ocean Park. It is the first oceanarium and the newest attraction in the city of Manila which features endemic marine life in the Philippine waters. University of Santo Tomas. The oldest university in the country that was established in 1611 and was originally located within Intramuros before it moved in España Blvd in the 1930’s. It also became a POW camp during the WWII. Cultural Center of the Philippines. It was built on reclaimed land during the Marcos regime and was set to be a center for the arts in Asia in the 70’s. Currently, it holds cultural shows and has been the home to Ballet Philippines. In 2000, it held the stage for the Broadway musical, Miss Saigon. Within the CCP Complex, a ferry terminal for the Sun Cruises offer tour packages to the historical island by the mouth of Manila Bay, which is Corregidor. The Baywalk. A promenade park along Roxas Blvd in Manila which offers a romantic view of the famed Manila Bay sunset. Some cruise ferries are available near the area to allow people to cruise around the bay from dusk ’till the sun sets. 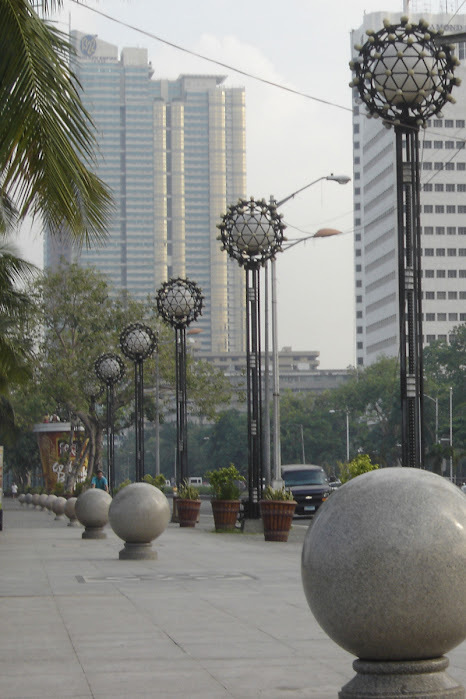 At the mid section of the promenade lies the Rajah Sulayman Park in respect to the Muslim King of Manila who ruled at the time of the arrival of Spanish explorers. Makati Central Business District (MCBD). Located in the city of Makati, this is the financial center of the Philippines where skyscrapers, international businesses, major banks, financial institutions, five star hotels, and major shopping centers are located. 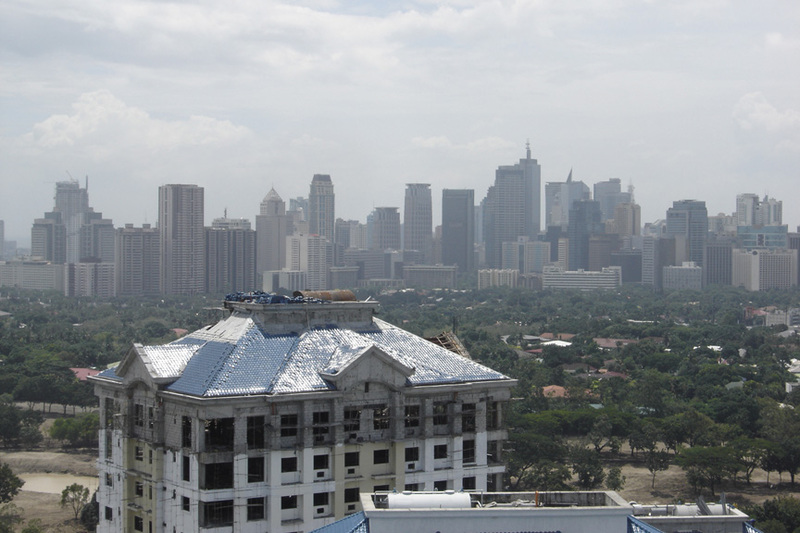 Bonifacio Global City and the Ortigas Center are the other major business districts in the metro that rival with Makati. SM Mall of Asia. 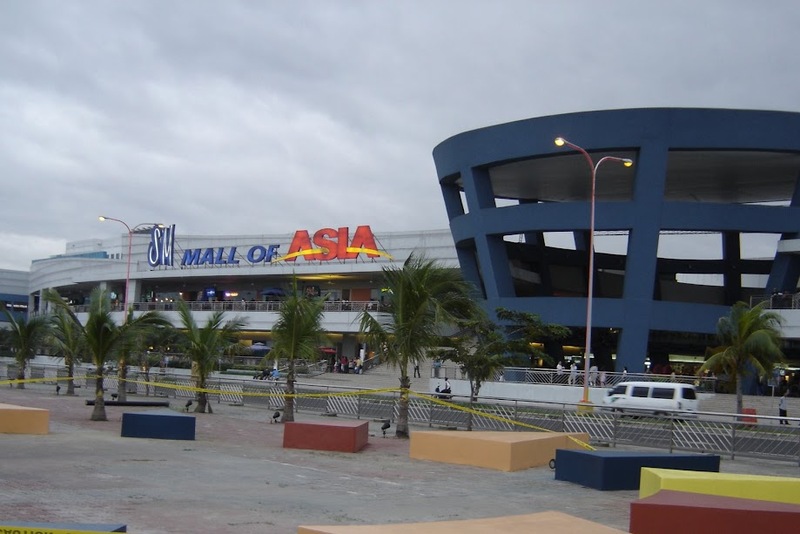 The Philippines’ largest and the world’s third largest mall. Situated at the reclaimed land on Manila Bay which features the country’s first IMAX theatre, an Olympic sized ice rink, cinemas, a planetarium, a science museum, a promenade park, and wide selection of shopping activities. Quezon Memorial. A three-leg obelisk that stood in Quezon City in commemoration of Manuel L. Quezon, president of the Philippines during the Commonwealth government and is considered as the father of the Filipino language. Bonifacio Monument. Erected in the city of Caloocan to commemorate the bravery of Andres Bonifacio, the leader of the revolutionary organization called the KKK which led the revolt against the Spanish regime. La Mesa Eco Park. An ecological park situated within the La Mesa Watershed in Quezon City at the northern part of the metro. The nature park envisions to impart with visitors the value of the environment and its preservation. Currently in progress is the Bagong Nayong Pilipino – PAGCOR Entertainment Tourism City which will rise at the reclaimed land on Manila Bay near the Mall of Asia. It is envisioned to become the Las Vegas of the Philippines featuring a giant Ferris wheel to be called the Manila Eye, a tall observation tower to be named PAGCOR Tower, a theme park, casinos, luxury hotels, resorts, sports complexes, and other amenities. Phase 1 is targeted for completion by 2010. Adding up a YouTube find of pre-War Manila, a time when the Philippines was under a Commonwealth government of the USA between 1935 -1946. *** Looking for Manila and Philippines Hotels? Check out HotelsCombined. This entry was posted in Asia, Historic Town, Manila, Philippines, UNESCO, WWII and tagged Asian megacity, Ayala Center, Intramuros, Luneta, Makati, Manila Bay, metropolitan area, Pasig River, Quezon City, Rizal, Spanish fort. Bookmark the permalink. Hey there! Come and join us for a BBQ buffet at the beach in Penang this Christmas with watersports activities included! Sign up now! Check out my website at http://www.runwiththewave.com See you at the beach! Thanks! one of the best city in the world. Great detailed article on Manila. Manila has really lot to offer! Aside from the shopping malls and tall business buildings, travelers can also get to enjoy Manila because of some historical places, parks, and more.